Larry Teixeira, O.S.S. 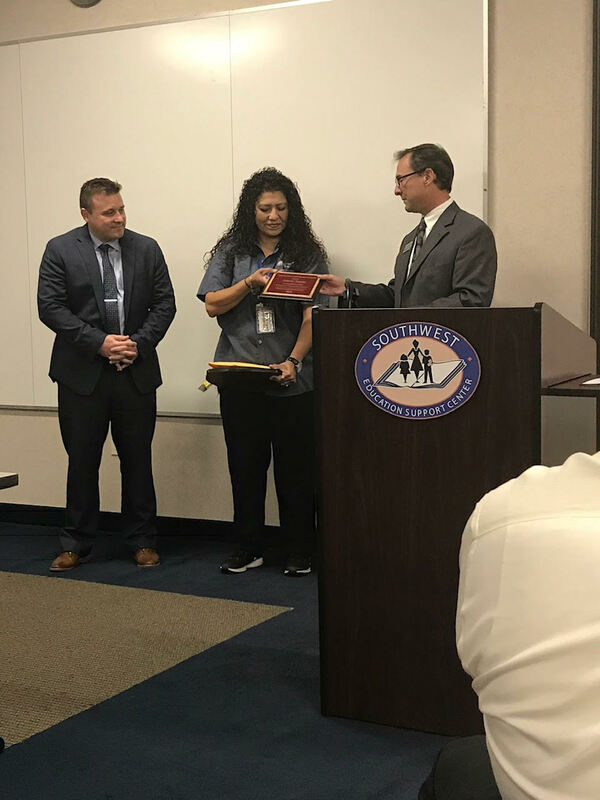 President presents a plaque to Salena Torres, a bus driver for Southwest Transportation Agency honoring her at their in-service day. Tyler Houston with Keenan & Associates looks on. 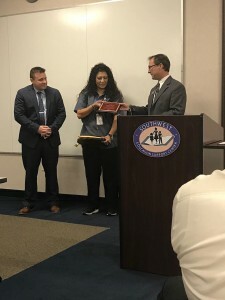 Due to Salena’s extraordinary presence of mind and bravery, she was able to ward off what could have been a disastrous situation to both herself and the students aboard her bus. A man boarded her bus with the intention of hijacking it and demanded she take him to the San Gabriel Mission. She was able to engage the radio, keeping dispatch abreast of the situation from the very beginning. As an added safety precaution, sh e removed and hid the keys which enabled the “Child Safety Alert System” alarm to activate. Her main concern was to present a calm demeanor to the students while trying to get the man off the bus as quickly as possible, which is what happened. In less than 4 minutes, police came, had the man apprehended and handcuffed.